“We are hopeful that the Scottish Government will now act to mitigate Personal Independence Payment cuts in the same way that it has protected disabled people and the poorest in our society from the iniquitous and notorious Bedroom Tax, soon to be abolished in Scotland,” say Black Triangle. Disabled people are being hit hard by the switch from Disability Living Allowance (DLA) to Personal Independence Payment (PIP). The replacement benefit PIP aims to drastically cut entitlement: in June 2010 George Osborne announced a target to cut the DLA budget by 20% through the introduction of PIP. The switch from DLA to PIP has resulted in 27% of those who have faced re-assessment suffering a complete loss of this benefit. Between 400 and 500 adapted cars, powered wheelchairs, and scooters are being taken away from disabled people every week in the UK. Now PIP is being devolved to the Scottish government. But for disabled people nothing has yet changed. Those on DLA are still being summonsed for re-assessment for PIP by the multinationals ATOS and CAPITA, who continue to follow orders to cut benefits. Now campaigners in Scotland are demanding that the Scottish Government cover the loss of DLA/PIP for all whose medical status has not changed according to the clinical opinion of their own GPs and specialists, pending the creation of the Scottish system. Activists from Black Triangle, Disability History Scotland, Disabled People Against the Cuts, Edinburgh Coalition Against Poverty, Radical Independence Campaign, Midlothian TUC, Midlothian Against the Cuts, RISE, ACE and North Edinburgh Fights Back were among those who signed the petition with this demand at the demo at the Scottish Parliament on 13 July. Meanwhile activists in Dundee and Glasgow were taking action at the local PIP assessment centres, as part of the UK-wide Day of Action against unfair PIP assessments. “We, the undersigned, call upon The Scottish Government to re-instate the benefits of Scottish-based Disability Living Allowance (DLA) recipients who have lost all, or part, of their disability benefits entitlement owing to having been re-assessed for Personal Independence Payment (PIP) under existing powers soon to be devolved under the Scotland Act, that are currently reserved to the U.K. Government and administered by the DWP. Outside the Scottish Parliament speakers from Disability History Scotland, Black Triangle and Edinburgh Coalition Against Poverty addressed the crowd. People expressed their willingness to take further action if the Scottish Government did not act to stop disabled people being penalised. The Tribe of Moles believes that a significant factor leading to the Scottish Government putting in the money to cover the Bedroom Tax was the realisation amongst local and national government in Scotland that the Bedroom Tax was unworkable here. Tens of thousands weren’t paying the resultant shortfall in their rent, and local anti bedroom tax groups round Scotland were pledged to act to stop any evictions resulting from these rent arrears. Counter power in action. If necessary, we need to be prepared to take direct action to stop the catastrophic impact of the PIP cuts on the disabled community. 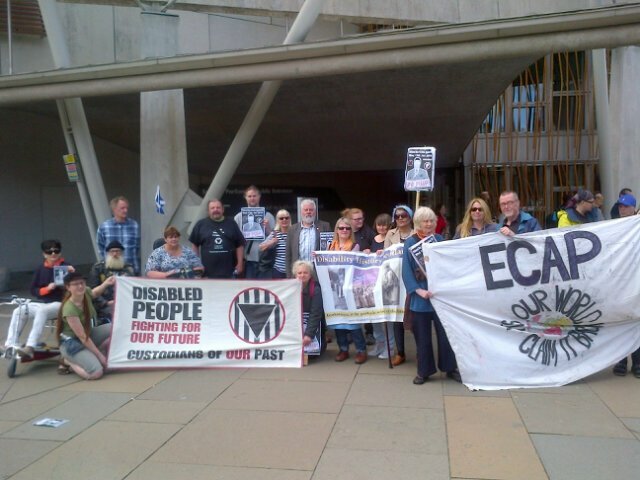 The Edinburgh demo against unfair PIP assessments was organised by Black Triangle, Disability History Scotland and Edinburgh Coalition Against Poverty, the Glasgow demo was organised by Glasgow DPAC and Black Triangle and the Dundee demo by Scottish Unemployed Workers Network. The UK-wide Day of Action against Unfair PIP Assessments was called by Disabled People Against the Cuts, Mental Health Resistance Network and Winvisible. Comprehensive info on applying for PIP is here. Dealing with PIP and Work Capability Assessments – don’t face them alone! More on this in next week’s Tribe of Moles! To reduce mobility to disabled people is the most inhuman activity being sanctioned by Westminster. Please can Holyrood, plug the gap, until it is in control of these payments. We live in a country where we elect a government to protect us from a government we did not elect! The government we did not elect hold the purse strings, i.e. including funding of disabled people’s benefits. Obvious conclusion, let’s remove the governmnet we did not elect fro the equation! Ah well, we had the choice and we rejected it. And yes, the feeble in society will pay an ever heavier price as we are head out of Europe whilst getting saddled with nuclear weapons. You couldn’t make it up. Ah the poison chalice of partially devolved benefits , give the scots control of giving out the money , but not the amount or the conditions…. with an end result of those disenfranchised SNP direhards , once a staple of Labour voting numbers , can then vote once again for red tory. The issue of Westminster Tory attacks on the disabled may well bring an MP Expenses magnitude set of jail terms for DWP staff and political directors. Just check out the legal action from two Scottish websites: http://www.calumslist.org (civil court) and http://www.blacktrianglecaaign.org (criminal court).